Once your little one gets big enough to make their way into the bathroom, there is one fixture that without a doubt will attract their attention. The giant ceramic bowl in the corner with a cool button that makes anything inside the bowl magically disappear with water is bound to be an immediate object of fascination. Unfortunately, a little one who is obsessed with flushing things down the toilet means that you have a septic system that is under a great deal of stress. There are a few things that should be done to prevent this issue and deter the unwanted interaction between your little one and the toilet. The first step you should take to prevent unwanted items from landing in your septic tank is to install a child safety lock on your toilet lid. 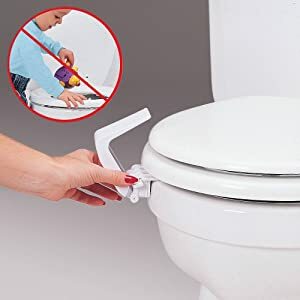 This simple mechanism is designed to hold the lid of the toilet securely shut with a small snap-in-place lever that can only be manipulated by skilled hands. These can be purchase in most retail stores and will definitely save you a lot of time and effort, as your curious youngster will not likely be able to figure out how to get the lid open for quite some time. The toilet without water just becomes a large ceramic bowl, and even though your little one may still be interested, it will no longer be near as exciting because it will not flush. Use the water cut-off valve at the base or behind the toilet to cut water flow and make sure you let visitors know what to do to make the toilet work when they have to go to the potty themselves. It may seem like an inconvenience, but this is a much better option than having to call on a septic tank service for help because your lines are cluttered with toys, rolls of toilet paper, or clothing. Part of the fascination with the toilet for children is the fact that items they throw in just disappear into the abyss, or so it seems. If your child is getting big enough to understand, try teaching him or her about where the items actually go and why they should not be there. You may be surprised at just how receptive a young mind can be when it comes to a major adult concern. If you want to make sure you are not left relying on a septic tank service to clean your tank, filled to the brim with unusual items, it is best to do what you can to help avoid the problem altogether. Children are always going to be curious creatures, but as a parent, it is your job to stay just a few steps ahead of their thought processes when you can. If you do need your septic tank cleaned, call a service like A-1 Sewer Service.